Understanding that our ability as technicians to responsibly assist with InnoDB corruption is very limited, I wanted to offer a basic guide that goes over some of the methods you can use to deal with some of the most common InnoDB corruption issues, from start to finish. It is fairly lengthy, so to skip sections, you can use your browser's Find to search for the sections by their identifier as shown below (/A/, /B/, /C/). 1. Stop the MySQL server. If it's already offline, or is crashing, skip to step 2. The goal here is to freeze the current state of the data and table files so that no new writes are occurring, and we can make file copies without concern of changes occurring that would cause data inconsistency, or loss of stored information. 2. Backup your data and log files, if not your entire MySQL data directory. First, you're making a directory to place any file copies in, then, you're creating a local backup of the ibdata1 file within /var/lib/mysql (or your data directory), as well as a backup of the ibdata and ib_logfiles to go into your backup directory. I like to use both dd and cp to make copies of the ibdata file(s), because of the difference in nature between the two utilities. The dd utility copies the raw file, while cp copies a file's contents to a new file. I haven't experienced any particular circumstance where this has been key to the success of recovery, however it's still a habit of mine that I suspect is likely not a bad one. Ideally, especially if you don't already have backups, you'll want to try and do a full copy of your data directory at this point, if at all possible. I realize this could be excessively time consuming or impractical for some in an emergency situation, so if this is not feasible, that's alright - the data files and InnoDB database directories should at least provide something to fall back on if needed. Dumping it with single-transaction flag creates the dump in, go figure, a single transaction, which prevents locking on the database, and may help if you're running a 100% InnoDB environment - so to be safe, particularly if you're not sure, I recommend running both. If MySQL has crashed, and refuses to start back up, then that's likely going to be your major concern at this point. Of course you want it online for production purposes, but on top of that, getting MySQL online allows you to get real MySQL dumps of your data so that you can minimize the chances of losing any data permanently, and help to repair tables that may be corrupted. Because of InnoDB's ACID compliance ( MySQL :: MySQL 5.6 Reference Manual :: 14.2.1 MySQL and the ACID Model ), it adheres to strict data consistency standards. This essentially means that, if it encounters any problems with your data at all, it will almost always crash MySQL in order to prevent further consistency issues. In theory, this is a good thing, but in practicality, unplanned downtime is never a good thing. Using the innodb_force_recovery option, however, can usually help to at least get MySQL back into an accessible state. That said, it's a good idea to know why this works, and how to use it with care. This configuration option should not be used as a long-term, or even a moderate-term solution to keep your server online. If your server can only stay online with innodb_force_recovery enabled, then there are still major problems on your server that will need to be addressed. If innodb_force_recovery is left on for extended periods of activity, you risk creating more issues on your server, particularly if set to a high value (there is never a good reason to leave innodb_force_recovery at 6 for any significant amount of time). This mode is entirely meant to be temporary - for recovery purposes only. So for example: if your MySQL server starts up on mode 3, but not mode 2, it might be a safe assumption to say that the crash has something to do with the transaction rollback process. Also, be aware that modes 4-6, as of MySQL 5.6.15, will place MySQL into read-only mode. If you've gone through all of the innodb_force_recovery modes, and you're still crashing with InnoDB errors, the next best move would be to try and gather some additional information about what might be causing the crash.. There are a number of different ways in which InnoDB problems can pop up, and while the blanket term "corruption" is generally used to cover a lot of it - often inaccurately - it's usually a good idea to try and identify specifically what you're dealing with. This executes the hostname command, and uses the string returned in place of `hostname`, which is the function of the backticks in the command line. InnoDB: file read of page 515891. This will generally be preceded with quite a bit more information, which you should take note of, as it can potentially contain some useful information about where specifically this corruption is happening, but ultimately this tells you that InnoDB seems to think you've got page corruption present on the referenced page ID, or potentially just the inability to read the file one way or another. This does not necessarily indicate proof of real corruption, and in fact, in some circumstances this can simply be the result of the operating system corrupting its own file cache. Because of this, it is often recommended to try restarting your computer - after making backups, of course - before moving forward with any further actions. That said - if a reboot DOES resolve your issue, you may want to make sure your RAM isn't defective or on its way out the door, as this can be one of the common causes for the OS to corrupt its own file cache. That would be a situation that you'd probably want to address before attempting any recovery, to avoid the risk of running into the same problems right off the bat. The innochecksum utility looks at the pages within a tablespace file, and calculates the checksum for each page. Then, it compares each of these to the stored checksum, and lets you know if there's a mismatch. If so, that will typically indicate that pages have been damaged in one way or another. If there are no mismatches found, it will not display any output (unless -v is included for verbose output). mysql: InnoDB: is in the future! Current system log sequence number 5 612394935. First, an explanation on what exactly a log sequence number (LSN) is. With each action that occurs on the InnoDB engine, records are written to the "redo" log file, typically seen as ib_logfile0 and ib_logfile1 within the MySQL data directory by default. There is a set size to these two files (48M each, by default, in MySQL 5.6.8+), and the records are written into these files sequentially, starting with the first log file until it reaches the end, then proceeding on to the second log file. Once it hits the end of the second log file (assuming that only the 2 default log files are configured - see innodb_log_files_in_group), it starts over and begins writing at the beginning of the first log file again. Each of these records is given an associated LSN. Additionally, when a database is modified, the particular page in that database is also given an associated LSN. Between the two of these, these LSNs are checked together to ensure that operations are performed in correct sequential order. The LSN itself is essentially an offset into the log files, and the LSN stored in a database page's header tells InnoDB how much of the logs need to be flushed. [ERROR] Table ./database/table has no primary key in InnoDB data dictionary, but has one in MySQL! To explain InnoDB's data dictionary a bit, it exists within the system tablespace - which itself exists as a special set of pages stored in the ibdata1 file (the system tablespace will always be referenced as "space 0") - and stores metadata for any tables, columns, or indexes that InnoDB handles explicitly. This is not the primary location for structural elements - those are found in the .frm files that exist for each of your InnoDB tables - however, it does contain much of the same information. This is where you'll typically see the discrepancies that cause these errors. If for any reason the ibdata1 file is altered, moved, changed by hand, or replaced - you've suddenly got a data dictionary that does not reflect what exists in your file or database structure. If you've read the previous error descriptions, you should understand at this point that there is a distinct association between data that exists in the ibdata1 (or otherwise named) file, and data that exists in the individual tablespaces/.ibd/.frm files. When that association is lost or severed, bad things can happen. So the most common reason you'll see data dictionary errors like these pop up, is because something was moved around, or changed by hand. It typically comes down to: "data dictionary expects this file or tablespace to be here, but it isn't! ", or ".ibd/.frm file expects this item to be in the data dictionary, but it isn't!". Keep in mind again that the data dictionary is stored in the ibdata files, and in most environments, that's simply going to be ibdata1, within the MySQL data directory. The logs are usually an immediate indicator of problems when they occur, however they can sometimes be a little vague. Often, you'll be left with an indication of corruption, but no specific idea of what tables, pages, or databases are affected. The two InnoDB-relevant methods of checking tables are the CHECK TABLE SQL statement, and the innochecksum utility. The method you use here is going to depend on one factor: whether your MySQL server is online or offline. MySQL is running and accessible? Use CHECK TABLE. innochecksum does not check tablespaces that are currently open by the server. MySQL has crashed or is otherwise offline? innochecksum is the way to go here - this looks at the pages within a tablespace file, calculates the checksum for each, and compares it to the stored checksum value. If these are mismatched, MySQL will crash, and corruption or data modification is evident one way or another, so this can be a reliable way to confirm a legitimate issue within the tablespaces. The CHECK TABLE command, which is also utilized by the mysqlcheck utility (specifically the -c flag, however mysqlcheck defaults to this behavior), runs through a number of different confirmations and comparison checks to try and identify signs of corruption. Both CHECK TABLE and mysqlcheck will work on MyISAM and InnoDB tables, however - for the context of this article - I'll be focusing on what it does with an InnoDB table. Be aware that the REPAIR functionality of mysqlcheck -r and the "REPAIR TABLE" MySQL command will not function on InnoDB tables; mysqlcheck is primarily only used in this context to identify the problem - not to resolve it. Existence of the corresponding .ibd tablespace file. Steps 1-5 repeated for all other indexes within the table. Finally, all tables undergo an Adaptive Hash Index check. If any of these come back with incorrect or inconsistent values, the table may be marked as corrupted. Once a table has been marked as corrupted, no further use of that table can occur until the issue is resolved, or until a follow-up table check is able to confirm that the issue no longer exists. In some circumstances, if the CHECK TABLE routine discovered a problem with an InnoDB table before MySQL had encountered it on its own, this may actually result in the MySQL server being shut down to avoid causing additional errors. While this is probably a good thing, because it can help you to stop any further damage from occurring, it's always good to be aware of this when you decide to run a CHECK TABLE or mysqlcheck on InnoDB tables. This is not the case when the issues discovered are simple corruption or errors. Corruption/errors discovered will simply result in the indexes/tables being marked accordingly. In this situation, the error experienced actually warrants the server being automatically shut down. The instant I ran the CHECK TABLE on roundcube.dictionary the first time, the server crashed. This is because I "introduced" the active MySQL instance to the problem's existence. InnoDB's data consistency compliance insists that it be stopped as soon as problems such as this become known. Depending on what exactly triggered the crash, a varying level of innodb_force_recovery is needed in order to bring the MySQL server back up. In the case of a missing tablespace, the lowest value - 1 - works just fine. Keep in mind that the MySQL server was forcefully crashed for a reason. Don't jump right back into MySQL by quickly enabling innodb_force_recovery! This has the potential, and sometimes the certainty, to cause more problems than it will solve. It will then output the results of performing a CHECK TABLE on each table within that database. You can also specify tables after the database name (mysqlcheck db_name tbl1_name tbl2_name...), if you'd like to perform it only on a few select tables within the database. Additionally, you can use the -A flag (or --all-databases) to perform a CHECK TABLE on all tables in all databases on your server. As mentioned previously, InnoDB needs to have consistent data, and when it runs into a checksum mismatch on its own, it will immediately stop an active server. With that in mind, innochecksum can be helpful not only in identifying corruption after the fact, but in keeping an eye on your checksum status in general. The only downside involved here, in the context of prevention, is the fact that it can't be run on any tablespace files that are open. So, in order to get any kind of decent picture of your tables' checksum status, the server would need to be brought offline. However, because what we're dealing with is corruption on a crashed MySQL server, that's probably the least of your worries. innochecksum is great in these instances for tracking down mismatched checksums, specifically because it doesn't require the server to be online. Once you've identified the issue and prepared your server appropriately, your next step is going to be getting your data back in working order. MySQL should be online and at least partially response at this point, either with innodb_force_recovery or otherwise. MySQL provides a downloadable set of utilities that includes some tools that may be helpful in the recovery process - in particular, a utility called "mysqlfrm" is included. This utility can extract a table's CREATE TABLE statement from a .frm file fairly easily. This statement can be extremely useful, because almost all useful recovery methods involve being able to re-create the structure of the original table you're trying to repair, and often, this must be done without having any direct MySQL access to the original table itself. # Spawning server with --user=mysql. # Starting the spawned server on port 3308 ... done. # Reading the staff.frm file. If you've identified that corrupt tables currently exist in your server, you've got a few approaches you can take here, depending on the severity. In almost all cases of table corruption, you'll at least need to be running InnoDB with innodb_force_recovery set to 1, to allow MySQL to stay online as you work with it. When it comes to page corruption, this method is the simplest, but probably has the least rate of success, given that it relies on you being able to functionally select all data from it and create a recovery table based on its structure. If any of that is inaccessible or otherwise unreadable, this method may fail. With this method, you can piece through the data that's accessible until you reach the point of failure, at which point you'll likely lose connection from the MySQL server. The success of this method will again depend on the ability for mysqldump to generate a functional set of data from each of the tables in question, but is often a more comprehensive approach as it involves initializing new ibdata and ib_log files. Because of that, however, this method also has a high potential to end badly if caution isn't taken. Make absolutely sure you've run through the steps in First Response and that you have a separate set of backups before moving forward with this. You can also use this method if you already have backup dumps that you'd like to restore over the existing corrupted databases - just start at Step 2. Perform a mysqldump of all databases. If you encounter any errors here, stop and take a look at the errors carefully. If they indicate that any of your important data is corrupted to the point where it can't be properly dumped, you may not want to proceed with this method. Also, be sure to take a look at the resulting dump file to ensure that it actually contains the expected data. Drop all affected InnoDB databases. Stop mysqld, after disabling innodb_fast_shutdown, which ensures a clean, full shutdown is performed. mysql -e "SET GLOBAL innodb_fast_shutdown = 0"
Comment out or remove any innodb_force_recovery entries you currently have in /etc/my.cnf. Restore the dump, once your confident that MySQL is still functionally online and ready to import data into. As a way of trying to make sure your data stays consistent, and also allowing for what amounts to "undo/redo" capabilities, InnoDB maintains what are referred to as log sequence numbers within the log files and tablespace files. Every time a change is made to any data in your InnoDB tables, that change causes the log sequence number to update. This amounts to an offset that instructs InnoDB how far forward or backward within the file it needs to look in order to reference a specific state of data. If at any point in time something occurs that causes one to be updated, but not the other, you'll end up seeing errors in your MySQL logs about a "mis-matched log sequence number", or "log sequence number is in the future'. It's important to get these back on track in order for your database server to function normally once again. Again, be sure that you've already made copies of all of your important ibdata, ib_logfile, .ibd, and .frm files before making any changes here. The first command ensures that InnoDB performs a clean shut down, which can occasionally help the situation, and is worth including here. This is another fairly drastic approach that, despite its heavy-handedness, seems to have a pretty solid success rate in my personal experience, though it's certainly going to depend on what kind of environment you're working with. This method also requires that MySQL can be started successfully. mysql -e "SELECT concat('ALTER TABLE ', TABLE_NAME,' ENGINE=MYISAM;') FROM Information_schema.TABLES WHERE TABLE_SCHEMA = 'db_name' AND ENGINE = 'InnoDB' AND TABLE_TYPE = 'BASE TABLE'"
mysql -e "SELECT concat('ALTER TABLE ', TABLE_NAME,' ENGINE=InnoDB;') FROM Information_schema.TABLES WHERE TABLE_SCHEMA = 'db_name' AND ENGINE = 'MyISAM'"
mysql -e "ALTER TABLE roundcube.staff DISCARD TABLESPACE"
In the above example, 'roundcube' is the database, and 'staff' is the table. If you check the database directory after doing this, you'll notice that while the .frm file still exists for that table, the .ibd file does not. Keep in mind that the table entry itself is still present on the server, though. [ERROR] MySQL is trying to open a table handle but the .ibd file for table dbname/tblname does not exist. 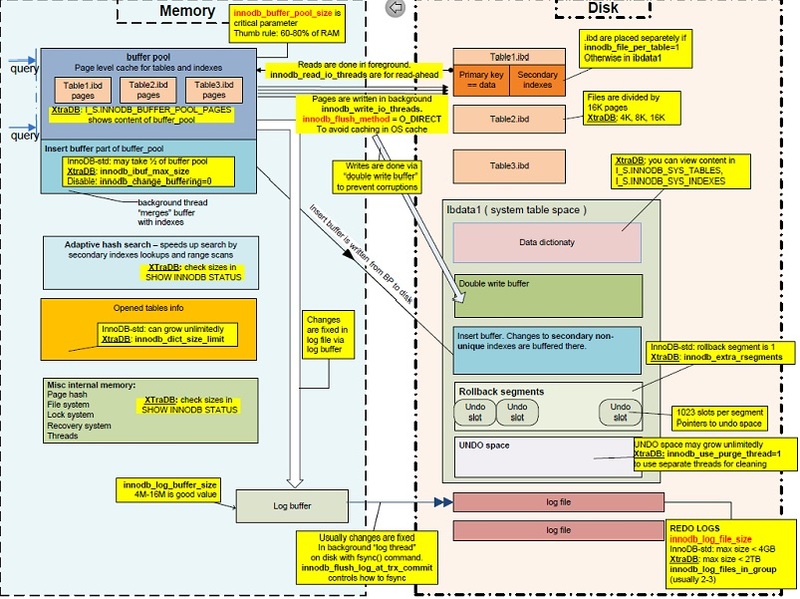 InnoDB: Warning: cannot delete tablespace 251 in DISCARD TABLESPACE. InnoDB: But let us remove the insert buffer entries for this tablespace. After that point you can re-create the table using either a backup, or a copied .frm file (using the mysqlfrm method described above). Here, the most common issue is that a partially executed drop or alter statement did not result in all the table's files being removed properly. In those cases, the .frm file can simply be removed safely, and InnoDB should adjust accordingly. Instead of removing it, though, my recommendation would always be to copy it to a backup folder, at least temporarily, so that you do have the CREATE TABLE statement, should you need to access it for any reason. If you did not intend to drop this table, or if the .ibd file was deleted by some other means, then - aside from attempting some deep data recovery by digging through the ibdata file - your only option in regards to restoring this table would be to restore from a backup, because InnoDB is essentially indicating in the error that this .frm file is absolutely the only thing left of the table in question. Definitely do not delete the .frm file if this is the case - simply relocate it so that you can perhaps have a chance of re-creating the table and re-building your data. InnoDB's data consistency standards are a double edged sword. It's a fantastic engine when it's managed carefully and with a full understanding of how it operates, however it is not the most forgiving when it comes to changes in its environment, unfortunately. It has some great approaches to handling situations on its own, as well as some excellent error logging, but it is absolutely something that demands a bit your attention when it comes to ensuring a stable environment. If you're still having problems at this point, don't panic - just ensure that you've made the backups described in the "First Response" section, at the least. That way, if it comes down to requiring real data recovery services to recover your information, you've got copies of the files you need that were made shortly after the issue occurred (time is essential, if you're considering data recovery - the more writes that occur after the problem is encountered, the higher the chance that your data will be irrecoverable). Dent and 57_Wolve like this.